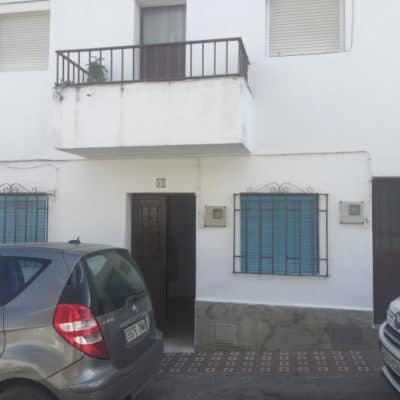 This 2 bed property is in prime location in the centre of Jimena Village. 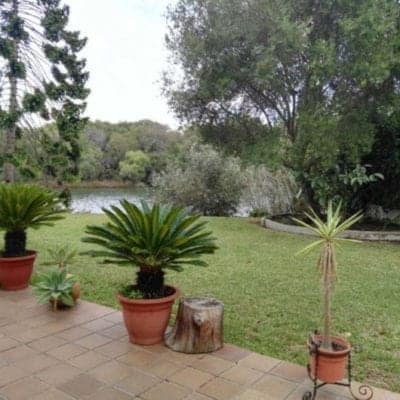 Walking distance to shops and schools. Close to Post Office. Plus, it has a garden with a couple of out houses which can be adapted with requisite planning permission to add a swimming pool for example. The upstairs is unused and can be reformed to add another bedroom and bathroom. This property with acess/egress via 2 streets can be reformed into two apartments. There is value in this property and after reforms it should be possible to rent out either short term or long. Rentals long term could realise approximately 500 – 550€ or more if a swimming pool added. After reforms it should be possible to put this back onto the market and expect to sell for approximately 125-150,000 € Even after requisite spending it should still return an interesting investment. Upstairs has original wooden beams. The foundations seem solid and it may be possible to to substitute a reinforced joist for one of the walls and gain at least an additional 50 m2. The adjoining property has added another floor and, as the precedent is set, this should also be possible here. In which case, the amount of work and the amount of returns would be even greater than those estimated. The location is highly desirable and near off road parking to add even another positive to this ever growing list. 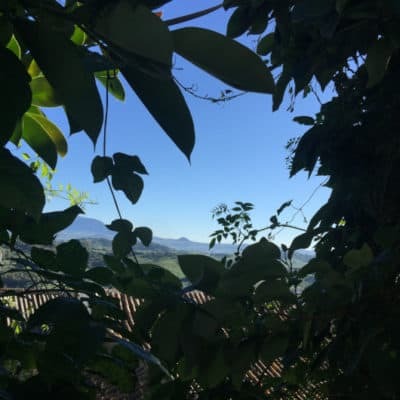 Jimena is popular all year round for holiday makers who visit for a wide variety of reasons from bird watching to rambling. In addition, the Arabic-Roman castle holds great historical interest as well as being a fantastic venue for flamenco and opera concerts. 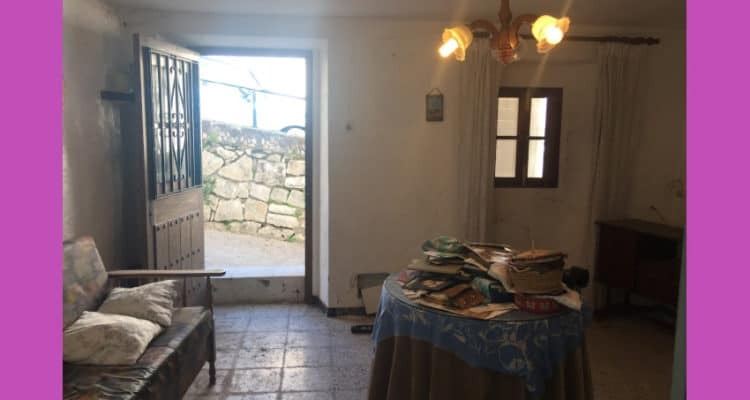 We strongly recommend that you visit this property so as to avoid disappointment. Contact us now to arrange a viewing. You won’t regret it. IBI is very low – approximately 150 per year. All of the apperwork is in order and this is priced to sell. Charming fully furnished 2 bed 2 bath property in heart of old village. 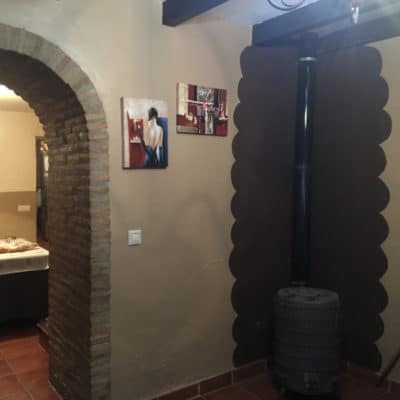 Original features – tiled floors and traditional metal work rejas. Open the front door and you are met by an open-plan design – sitting room, dining room and kitchen. From there you access a breakfast room with glorious views. There is a pretty archway bedecked with flowers and steps down to the all important swimming pool with wonderful views. The two bedrooms and two bathrooms are upstairs. Bathrooms are shower room and full sized bath respectfully. 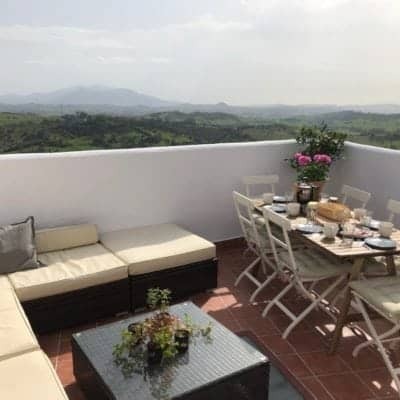 Although in the old quarter, it is on a hill and the main bedroom has French Windows that open out onto a terrace with views over the roof tops to the Serrania de Ronda. Not to be outdone, the bedroom with twin beds has a balcony with views of the castle and south west to Gibraltar. 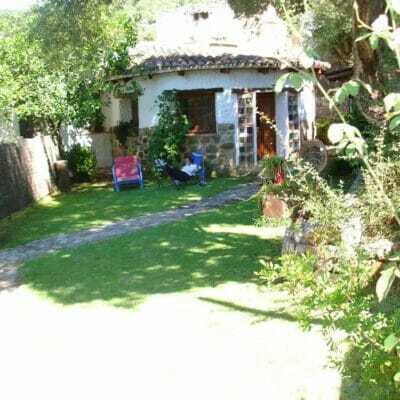 Jimena de la Frontera is nestled within the beautiful countryside of the Los Alcornocales Natural Park. A beacon for bird watchers, archaelogists, choristers and ramblers to name but a few. All in all, a picturesque white village with approximately 10% of population being from other countries or regions. The village is very welcoming and with 2 banks (and even a supermarket that opens on Sunday mornings) it has all amenities. Restaurants are within walking distance and a local store very near too. Rental does not include utilities. In addition, to protect both the tenant and the owner, we take out character and solvency references and there is the equivalent of a 2 month fully returnable deposit – dependent on usual verification. 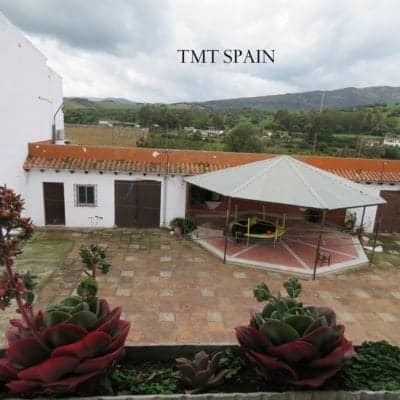 8 bed property situated in the upper part of Jimena de la Frontera. The house is already divided into an upstairs with huge terrace space and a downstairs. Both with independent front door. The downstairs apartment also benefits from outside space including a small allotment / orchard. This garden could be used for a swimming pool or jacuzzi. In addition to these two residential zones, there is a further downstairs area which consists of 2 covered areas facing south east over the hills. This space alone is approximately 80 m2. Half of which is used as a garage with narrow access and the other building is used as a large store room. Much could be made of this unused space. Downstairs is a 3 bed, one bath, with sitting room that leads to the kitchen and patio area. Upstairs has a large open plan sitting room and 3 large bedrooms with exterior light. Another 2 bedrooms do not have natural light coming in. There is a good sized kitchen and 1 shared bathroom. In addition, 2 of the large bedrooms have an ensuite. The kitchen leads out onto another living area which is a covered porch of approximately 50 m2. There is a fire place, large dining table and living area, plus small wash basin for preparing food for the barbecue. Above this floor is a solarium with covered washing area. To recap, downstairs has 3 bedrooms one bathroom and upstairs has 5 bedrooms and 3 bathrooms in all. The front of the property upstairs has a sitting room with natural light coming in. The large covered porch/terrace at the back of the house is clearly used all year round. It is a really great area with wonderful views of the Los Alcornocales Natural Park. This area could perhaps be separated with glass curtains from the metal stair case outside that leads to the roof area. There is a lot of potential to convert this into a large BnB or short term lets property. The built surface area is 232 m2 and this extends up over 3 floors – approximately 500 m2 in all. 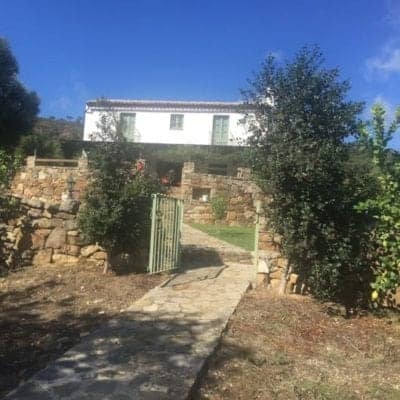 If you do decide to buy for a short let rentals property, we can help you with the licence for either vivienda rural or casa rural. Another advantage is that this property looks out onto common land that cannot be built on so the views are here to stay. This west facing 3 bed apartment is in a prime location. 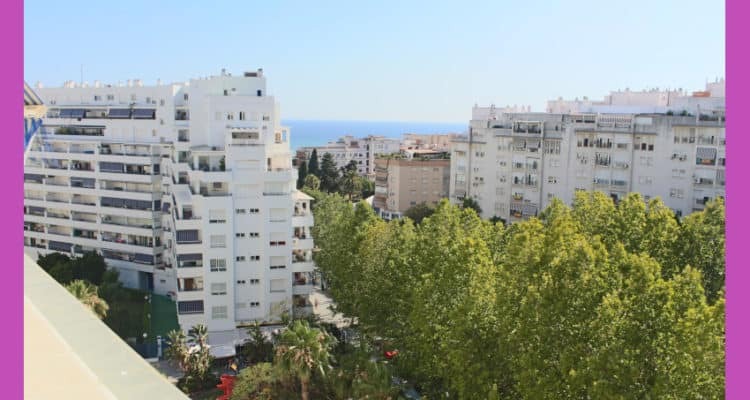 Situated on the ninth floor, it has views of the sea and the mountains. What is more, you can obtain a 100% mortgage to buy it. Plus, the beach is a stone’s throw away. 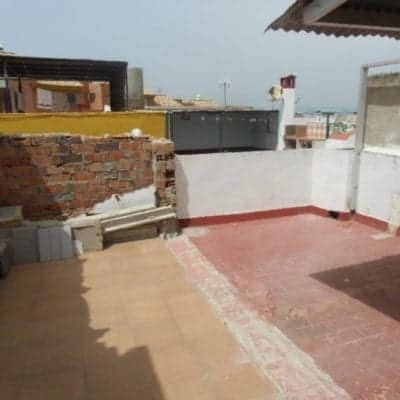 Three double bedrooms, 1 bath room, 1 cloakroom, separate kitchen with eating area. Large 30 m2 sitting room which leads out onto a 9m2 terrace. 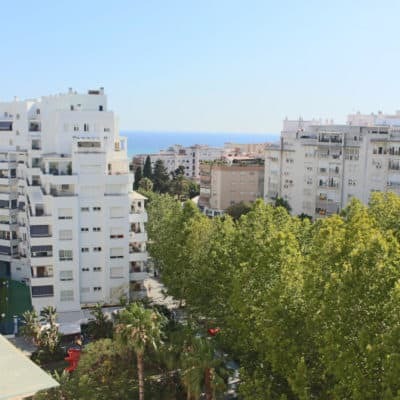 This is a large, bright and airy apartment of 121 m2. It also has dedicated underground parking and storage facility. 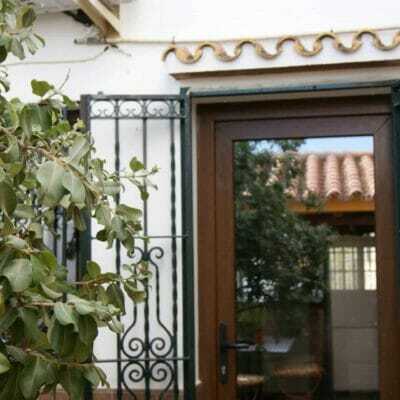 In addition the community of owners benefits from communal pool and gardens. Built 2003. Ideal location for access to the old town on foot. 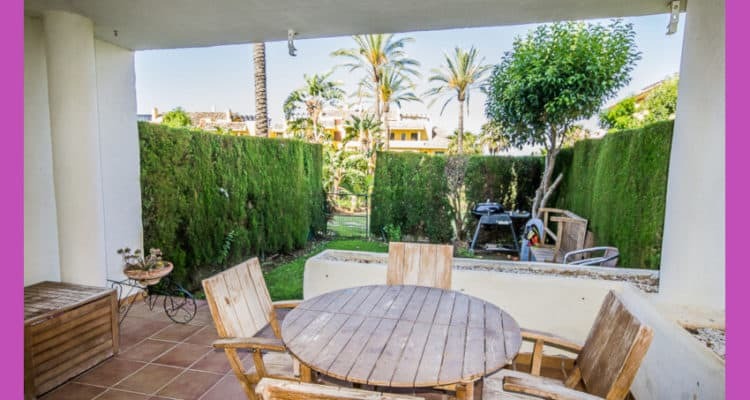 Also, walking distance to the beach and La Bajadilla Marina (150m). There are a plethora of restauarants from Mexican, pizzerias, and bistros and all are close to hand. Should you wish to swim off season, the public swimming pool is also nearby. There are 2 private hospitals, a fitness centre, and an esplanade for some old fashioned exercise. Calle Ricardo Soriana is a bike ride away. Just what you would expect from being in a town centre. All amenities including schools and supermarkets are on your doorstep. Also, with your own private car parking place you never have to search for a parking spot on public roads. Nor pay car park prices. The May feria is celebrated around the old quarter and the Alameda Park. And guess what? Yes. All close by. Subject to criteria, you can get a 100% mortgage to buy this property. You would need savings of approximately 12% to cover taxes (8%), Notary (1%) and Land Registry Fees (1%) plus incidental expenses incurred. All in all, a great opportunity. Either with or without the mortgage option, this is a very interesting property. Don’t miss out on having your finger on the pulse in this stylish town. 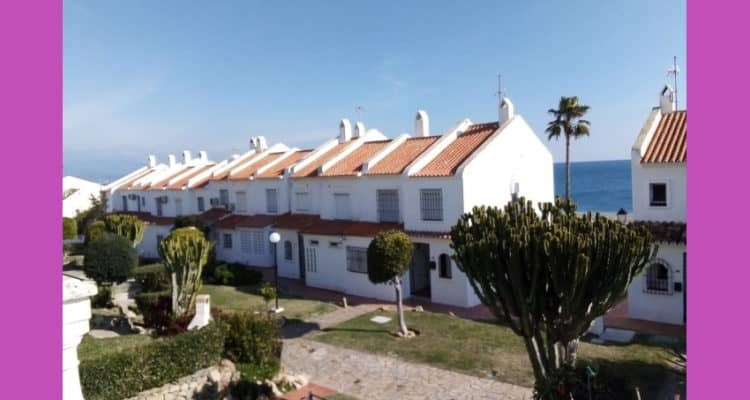 Splendid 2 bed 2 bath apartment with views of Gibraltar in the much sought after urbanisation Costalita II 1 km from Estepona beach front. 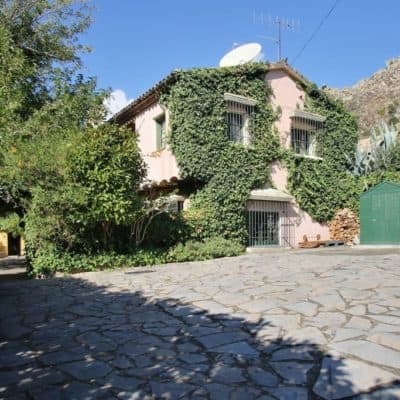 Priced to sell at 255,000€. Spacious ground floor property of 2 bedrooms and 2 bathrooms, one ensuite. Large separate kitchen which connects to the large sitting room through a serving hatch. 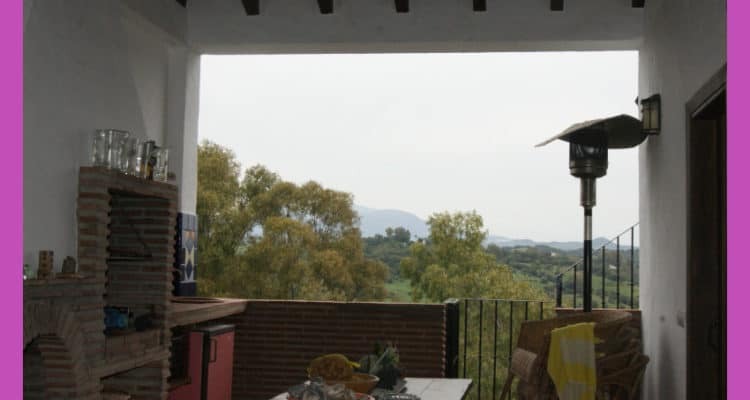 The property is 110 m2. In addition, the property has fitted wardrobes and air conditioning. You also have a separate, private, storage facility for garden furniture, bikes etc. The development was constructed in 2003. It has the added bonus of hedges around the private garden making it feel self contained despite all the benefits of a maintained urbanisation. Another plus, is that this area has a fantastic reputation on booking.com! A quick search COSTALITA 2 or COSTALITA II shows fully booked from April onwards. 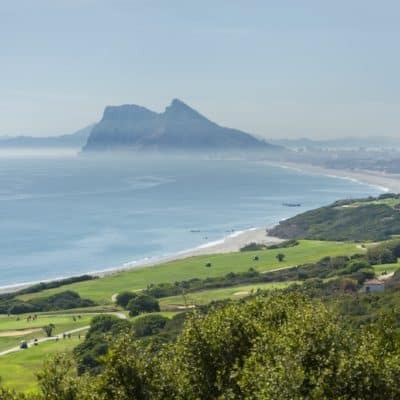 The proximity to the beach and golf are marvellous incentives. 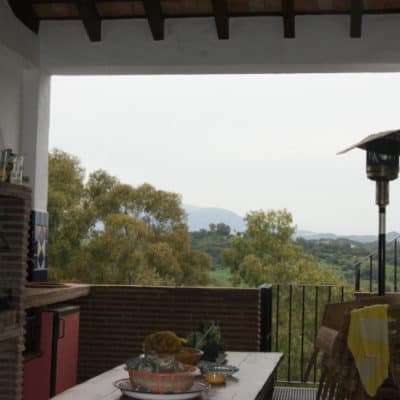 The urbanisation is on the eastern fringes of the municipality of Estepona, in Cancelada, Estepona. This is where the Estepona Golden Mile joins the Marbella Golden Mile. It is also near to all the amenities people look for on holiday. Supermarkets, restaurants etc. In addition it’s not far from some of the famous hillside white villages. 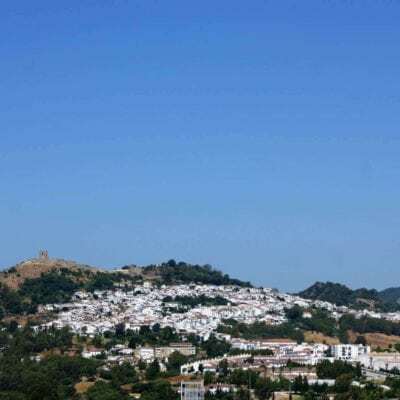 Including Casares – birth place of the famous Blas Infante which is half an hour away. The development itself is a safe, closed community. There are 2 gorgeous swimming pools and beautiful communal gardens to walk around at your leisure. The grounds and pool are maintained to a high standard, and it works out much cheaper than a villa’s maintenance costs for example. 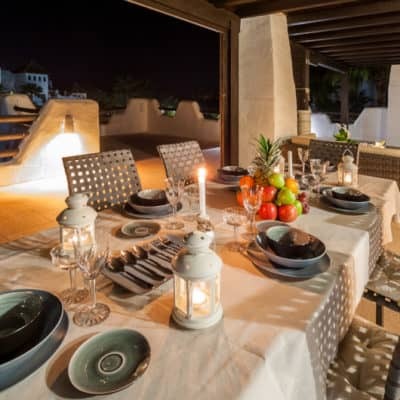 Plus, do not forget the added bonus of the private, hedged, garden where you can have barbecues, sun bathe on loungers or just sit at the table and enjoy al fresco living. After all, this is the Costa del Sol! It is a small quiet complex set amongst tropical gardens with Pool and play area. Choice of beaches within 1km. The 6* Villa Paderena Hotel and world famous Flamingos golf club are 200 yds away. The 4* Occidental Estepona Thalasso & Spa hotel is adjacent to the complex. Large choice of Supermarkets and restaurants within walking distance. Puerto Banus is 6km, San Pedro 4km, Marbella 10km, and the old Spanish town of Estepona is 10km. Underground parking and storage in the garage. Beautiful sub tropical gardens with water features and a dazzling swimming pool (including a small pool for young children, child’s swing and play area ), all completely enclosed. You can walk to the beach in 20 minutes, the shops and restaurants in 10. The grounds are impecccably maintained and the outdoor pools are an added option if you don’t fancy a (very) short walk to the beach. There are several choices available if interested in this property. You can buy it to live in year round or just for holidays and with an eye on the short term rentals market to cover community of owners fees and your own holidays anywhere in the world! 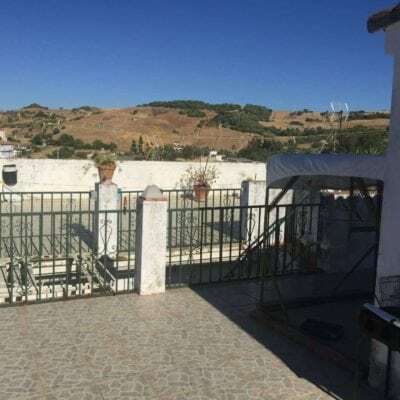 You could also offer it for long term rentals, but it is such a popular setting that it would be a shame not to maximise your own use of this wonderful ground floor apartment with private garden. This bank repossession has great opportunities to get up to a 100% mortgage – depending on if it will be your permanent home and on your own personal circumstances. Community of Owners Fees TBC. Hurry. This is already attracting interest. Enough said. For only 255,000€ you have a very solid investment.